Get full body massager at home with this advance Relax & Spin Tone Hand-held Full Body Massager, this portable device can massage you anywhere you want. It is designed to give quick relief to the body muscles and reduce pain. It is 100 safe massager to use at home. Order it now. Function: 1.Wavy attachment - Deep tissue massage and muscle toning 2.Mesh cover attachment - Prevent entanglement and provide maximum comfort 3.Flat attachment - Gentle massage on neck, shoulders, back and legs, relieve muscle tension. 4.Micro filer attachment - Remove calluses and dry skin on your feet. 5.Roller attachment - 8 specially designed rotating beags help slimming gel, massage oil or lotion to penetrate deep into your skin. Massagers here feel like one of the best in terms of looks and feel. I doubt that there is any massager that comes close to its quality. it is Portable and lightweight, Incremental speed dial adjustment, High rotational speed up to 2500 RPM, Comfortable soft rubber hand grip, Four attachments for different usages and Tones muscles and releases tensions which makes it best massager all the time. i am using this massage for a week and found noticeable change in my body's pain, it is so relaxing. Dear Zoya, you can order this by filling up simple form at the right. i think that its really useless to buy this messager because i think that its not at all a good thing as it is of very low quality and the price is also very very expensive som please launch more things but not like this. truly one of the best and most awesome inventions. the massager is undoubtedly a relaxer of the highest sort. i usually do it when i lie down to sleep and trust me the sleep i get after this soothing massage is one i wouldn't sell for a billion bucks. 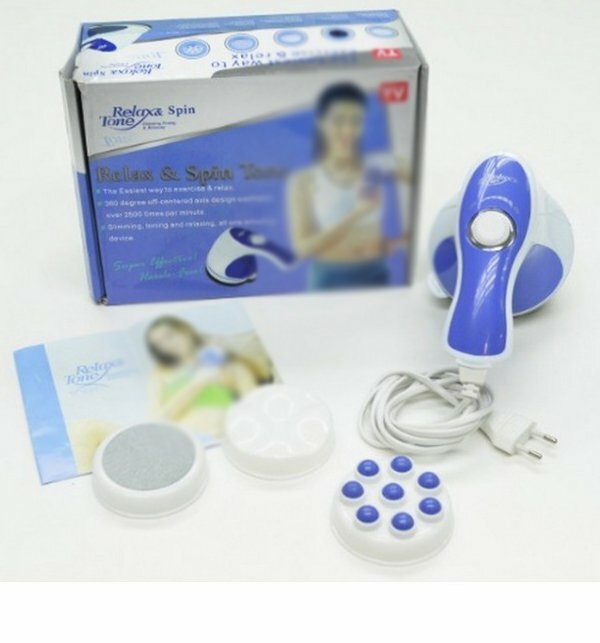 You are looking now latest Relax & Spin Tone Hand-held Full Body Massager price in pakistan market 2017 including in all major cities, Relax & Spin Tone Hand-held Full Body Massager Price in Karachi, Relax & Spin Tone Hand-held Full Body Massager price in Lahore, Islamabad, Faislabad, Pesahwer, Quetta, Multan, Rawalpindi and many more cities.